First, cream together the butter and sugar. 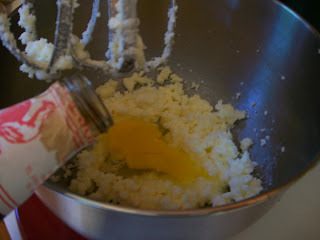 Then add the vanilla and the eggs and beat until combined. 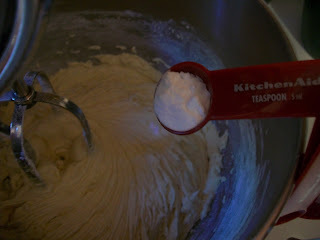 Gradually add the flour, then the baking soda and salt and mix just until combined. Then add the can of pie filling. You want the beaters to kind of chop up the apples a bit since they are in slices. Fill the muffin cups with the batter. These will be VERY full – up to the rim! 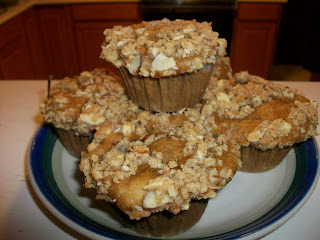 To prepare the streusel, combine the flour, brown sugar, oatmeal, cinnamon and chopped almonds. Cut in the butter until coarse crumbs are formed. Spoon the topping over the muffin batter. Get more ideas at Monday Muffins, What's Cooking Wednesday and What did you Bake Today? Cream together the butter and sugar. Add the vanilla and eggs; beat until combined. Gradually add the flour, baking soda and salt. Mix just until combined. Add the pie filling and beat well until apples are chopped up. Spoon batter into 12-16 muffin cups. 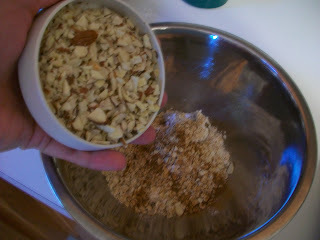 To prepare streusel: combine the flour, brown sugar, oatmeal, sliced almonds and cinnamon in a small bowl. Using fingers or two forks, cut in butter to flour mixture until it resembles coarse crumbs. Spoon topping onto muffin batter. Bake at 350 for 25-30 minutes. Cool on a wire rack. Makes one dozen. WOW that topping looks fabulous! I didn't expect that. Yum! Those look so delicious! I am copying the recipe right now. Thanks!! These look sooooooooooooooo delicious. I can't wait to try them. Fabulous! 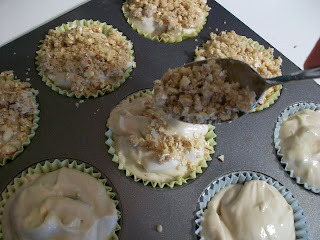 Thanks so much for linking your recipe up at Muffin Monday! Our followers will love it! This looks so yummy! I'm have a recipe only link party "Cast Party Wednesday" and this would be perfect. Would you come over and share some of your recipes with us? Anon, a 20 or 21 oz can would work in these muffins. I have homemade apple pie flling in my freezer that I needed to use up. I'm looking forward to trying these. So good! Used homemade pie filling, replaced 1/2 the flour w whole wheat, and cut back on the added sugar. In the topping I added about double the oats and it was perfect!! 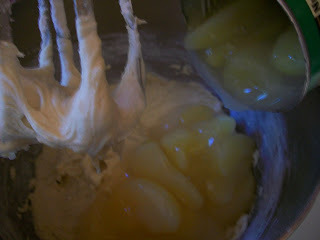 awesome recipe...tastey and very moist....I used apples I canned (to soft to eat like pears). Definitely a keeper...my kids gobbled them right up.